A new year of racing has arrived and all of a sudden the events of 2017 now seem like a distant memory. Last year was full of headlines and history making feats with the more notable amongst them including Winx winning her third consecutive Cox Plate and taking her winning streak to 22 wins, and the running of the inaugural Everest. As punters settle into 2018 and ready themselves for another bumper season of racing, we’ve compiled the list of thoroughbreds who are set for a huge 2018. Redzel: The Peter and Paul Snowden trained five-year-old turned a corner last preparation after winning everything he lined up including The Everest. Easily improved 5L from his Autumn campaign and only needs to maintain that in 2018 to prove he’s still the best sprinter in the country. Our Crown Mistress: Won four on-the-trot in her first preparation and recently won a trial at Warwick Farm by 5L. The Waterhouse-Bott trained filly is bomb proof, possessing plenty of early speed and the ability to control the pace of a race with a big engine to-boot. This is a horse on the rise and she’s in the hands of arguably the best training partnership in Australia. Sully: Trained by Trent Busuttin & Natalie Young, Sully was runner-up in the 2017 Victorian Derby and looks to have massive scope for improvement. He was ridden upside down in the Victoria Derby and didn’t get much luck throughout the rest of his the preparation. Expect the gelding to improve significantly off the back of a spell and win some strong staying races in 2018. Ace High: The David Payne trained galloper was super impressive in his last preparation, winning three from five starts including the Victoria Derby where he came from behind to blitz the field by 2L. Expect this colt to scale new heights in 2018 with more Group 1 success inevitable. Viddora: Got her well-deserved maiden Group 1 victory in the Winterbottom Stakes over the Perth Carnival. Prior to that, the Lloyd Kennewell trained five-year-old was an unlucky fourth to Hey Doc in the Manikato Stakes and had a narrow miss in the Moir Stakes after losing out to the promising She Will Reign. The mare destroyed a ‘B’ grade field of sprinters during the Magic Millions carnival and connections will now have their sights firmly set on The Everest this year. 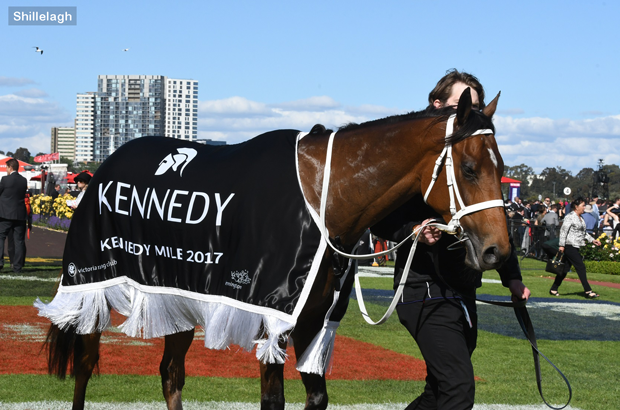 Shillelagh: We saw how good this former New Zealand mare can be when she gets an even break, after storming to victory in the Group 1 Kennedy Mile on Oaks day. Expect further improvement from the Chris Waller trained six-year-old as she shapes up for her fourth Australian preparation, with the Doncaster in April a likely target. Egg Tart: Was impressive as a three-year-old with five wins from five starts in the first half of 2017. She was then tested against the best Group 1 company last Spring and didn’t quite aim up but had excuses. The Waller stable will be eyeing off the Autumn carnival as a perfect opportunity to prove that the mare has what it takes to mix it with the best milers in the land. Pierata: The Greg Hickman trained colt has raised plenty of eyebrows this Summer after recording three wins and a second from four starts, culminating in a dominant win in the 3YO Magic Millions Guineas. The son of Pierro has been touted as the most promising horse in Australia at the minute and connections will now look to the Doncaster and Stradbroke Handicap for Group 1 glory. Rekindling: The Lloyd Williams owned four-year-old took many by surprise after cruising to victory in the 2017 Melbourne Cup. He will only mature from that run and is likely grow another leg after a strong Australian Autumn campaign. Come Spring, expect the Joseph O’Brien Irish stayer to be even stronger than last year and take a ton of beating as she attempts to claim back-to-back Melbourne Cups.